Everything (plus more) that anyone wants or needs to know about burgers. 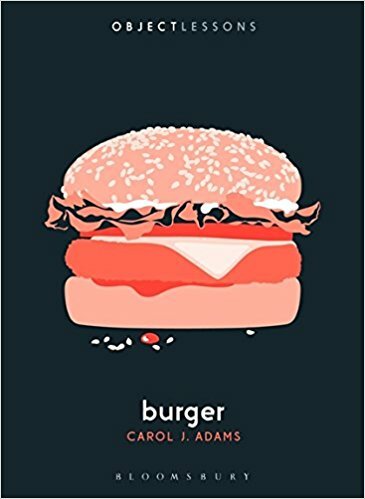 Burger is part of a Bloomsbury Academic series of object lessons. Each brief book takes a noun and writes an interesting essay about it. Each is written by a different author. I really enjoyed Souvenir, which I gave 4 stars. It was chock full of relevant and not-well-known information about the history and reason for souvenirs. Burger fails, at least to me, to meet the interesting requirement of this series. It starts well with the history of cattle beginning as aurochs. Those are the same animals depicted in famous French cave art circa 17000 BC. It explains how the overhunting of the Buffalo after the Civil War allowed for free cattle grazing on government land and cattle drives to centralized Chicago slaughterhouses. There was also a chapter explaining how dairy cows are slaughtered in detail. It included a brief discussion of the first burger chain, White Castle, and burger drive-thru, Jack in the Box. However, subsequent chapters were not to my taste and seemed off subject. How the names of burgers like the Thickburger and the Whopper were covertly referring to men’s erections. How commercials showing woman eating large burgers were implying they were experienced eating large meat (wink, wink). Some of the topics seemed to have been found by a random Google search. For example, how Vietnam and World War I had “burger terms”, Hamburger Hill and the Meat Grinder respectively, for battlefields where soldiers’ odds were not good. The Mad Cow disease scare, anti-animal rights acts, greenhouse gases caused by cows and several chapters on veggie and laboratory burgers’ history and future seemed added just to reach a certain word count or perhaps to further a meatless agenda. Overall, I can’t recommend this book. 1 star. Thanks to the publisher, Bloomsbury Academic, and NetGalley for an advanced copy.